At first blush it makes perfect sense to review these recently published books together. After all, each one addresses a major element – if not the two most important elements (or two of three if we consider Calatrava's Oculus) – of the sixteen-acre World Trade Center site. Further, it appears the publication of each book was timed to the annual anniversary of September 11th, in this case fifteen years after the terrorist attacks that destroyed the Twin Towers. 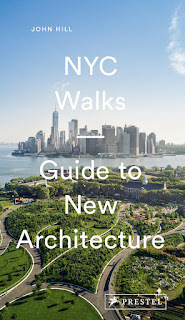 A fair number of books on the original WTC came out in the years after 2001, followed by books addressing redevelopment and Daniel Libeskind's winning master plan. But these two books are the only recent ones I'm aware of on the architecture of the WTC site, so it makes sense to bundle them together. That said, the differences between the two books – and their subjects – situate them as nearly polar opposites to each other. One is focused on the memorial, specifically the 5,200 memorial ideas that did not win the competition and therefore were not built; the other is about the realization of the site's most prominent tower, what has become the tallest building in the western hemisphere since its 2015 completion. Along these lines, one presents individual efforts to cope with a horrific act, while the other documents a design that results from collaboration: of architects, engineers, clients, and builders. And, of course, one is about making money while the other one is not. The content of each book reflects these differences. Judith Dupré should be a familiar name to architects as well as laypeople who are fans of architecture, particularly tall buildings; her oversized book Skyscrapers: A History of the World's Most Extraordinary Buildings was first published in 1996 and was most recently revised and updated in 2013. (Fittingly, Dupré wrote Skyscrapers in the World Trade Center.) Although One World Trade Center does not approach the 18-inch-high paper size of Skyscrapers, it is nevertheless a big book – all the better to take in the large color photos but also the timelines and other parts of the book that pack lots of information onto the individual pages. As the title makes clear, this is a book about One World Trade Center (1WTC). Nevertheless it contains chapters on the other parts of the WTC site: the National September 11 Memorial & Museum, 7WTC, towers 2-4WTC, the Transportation Hub, St. Nicholas, and Liberty Park, many of which the author discussed in her book talk at the Skyscraper Museum I attended back in June. With this extra content, the book is the most complete book on the rebuilding efforts to date, not just a biography of 1WTC. Regardless, people will buy this book because of its namesake subject – and they will not be disappointed. 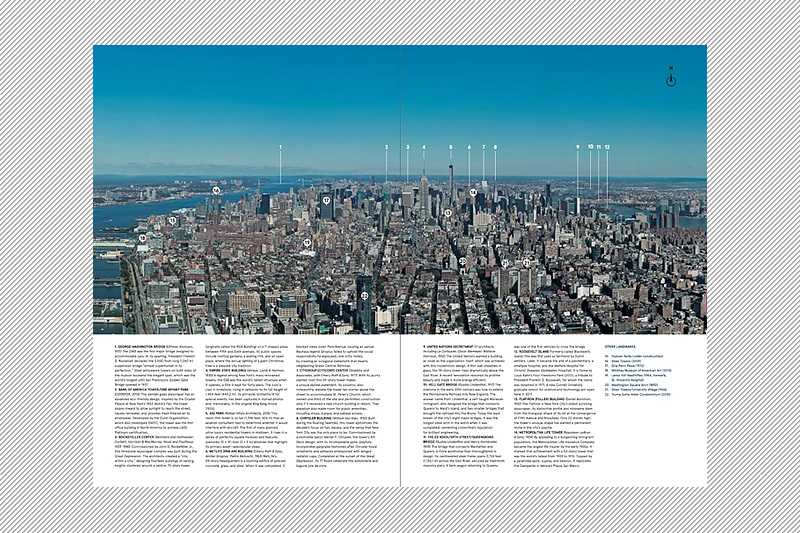 Five of the book's twelve chapters are devoted to 1WTC. From these handful my favorites are "Evolution of the Tower's Design: 2003-2005," "Into the Blue: Designing One World Trade Center," and "Construction Timeline: One World Trade Center." The first and third are particularly helpful in our amnesiac age, since they remind us how the tower design changed from a Libeskind to an SOM, and how the nearly ten-year construction unfolded. Throughout, Dupré is very positive about the building (she likes it much more than I do), but that does not mean she isn't critical when warranted. A sidebar on the value engineering that stripped the spire of its cladding is a good case. Nevertheless, this is a biography that celebrates a building, one whose 2015 completion made it feel like the WTC site was finally closer to completion rather than closer to the destruction that warranted the project to begin with. While Dupré contends she was "the only writer given unfettered access to the Port Authority’s site and archives" for creating her book, Lester J. Levine, a management consultant and poet who lives in North Carolina, was at the mercy of an outdated website and many hours spent tracking down the authors of notable memorial submissions when it came time to collect a small fraction of the 5,201 entries to the 2003 World Trade Center Site Memorial Competition for his book. 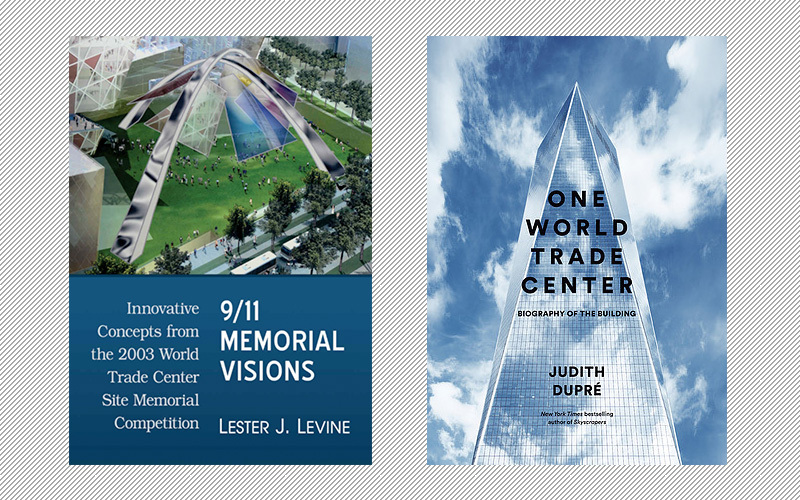 The winning memorial, "Reflecting Absence" by Michael Arad with Peter Walker, was completed on the tenth anniversary of the 9/11 attacks, so Levine's book doesn't exist to proffer a preferred alternative – a what should have been – for the site. Rather it tells the stories of the people who submitted designs that share some innovative ways of approaching memorials. 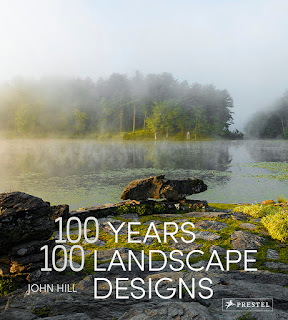 If a book can be judged by it cover, I was not optimistic about 9/11 Memorial Visions. It's hard to imagine the cover scheme, with glass panes suspended from two St. Louis Arch-esque structures, existing on the WTC site. Further, the quality of the renderings shows just how far we've come in the last dozen years when it comes to computer graphics. That said, I was amazed to find myself liking the book a lot – though not necessarily liking many of the 180-plus schemes that Levine chose to focus on. But there is something to be said for highlighting designs that are a strong departure from the minimalist, Maya Lin-inspired visions that now predominate when it comes to memorials. Like others, I'm drawn to abstraction over figuration in memorials, but who's to say I wouldn't like a memorial with lots of color, or one that was all about sound, or one based highly on technology if it were given the chance? With Levine's focus on the stories behind the entries, it's the words in his book that take priority over the images. His laid back, conversational style makes the stories accessible, and it allows entry after entry to be read easily in order; it's like they are pearls on a string and he pulls the reader along one after the other. He groups similar approaches (color, sound, and technology, as mentioned, among others) into a dozen chapters, but all entries are unique. Yet what stands out above the variety of designs is the diversity of voices: architects and artists are represented but so are musicians, students, scientists, even a truck driver. 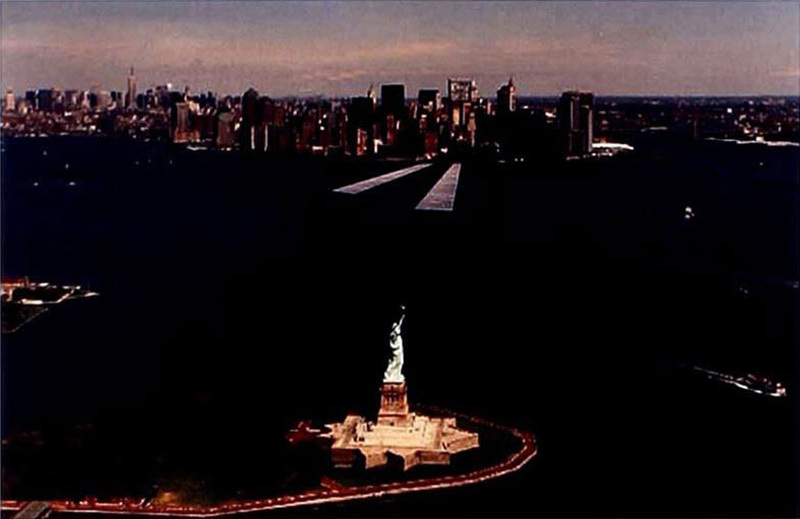 The World Trade Center Site Memorial Competition was open to all, and with a major event so fresh in people's minds at the time, it became a means for all sorts of people to cope with the loss and its repercussions. So kudos to Levine for digging through the entries, discovering the voices behind a sampling of them, and prompting us to reconsider what memorials mean to people in the 21st century.